Lt. Col. Jeffrey Holt, commanding officer, 3rd Battalion, 3rd Marine Regiment, hands the 3rd Marine Regiment battle colors to Lance Cpl. Michael Murray, an assaultman with 2nd Battalion, 3rd Marine Regiment, during a Fallen Heroes Run here Wednesday. Since 2004, 116 Marines and sailors from 3rd Marine Regiment have been killed during operations in Afghanistan and Iraq. On Tuesday and Wednesday, teams of at least two Marines or sailors in combat boots and camouflage trousers ran a 2-mile evolution 116 times — one for each fallen hero. 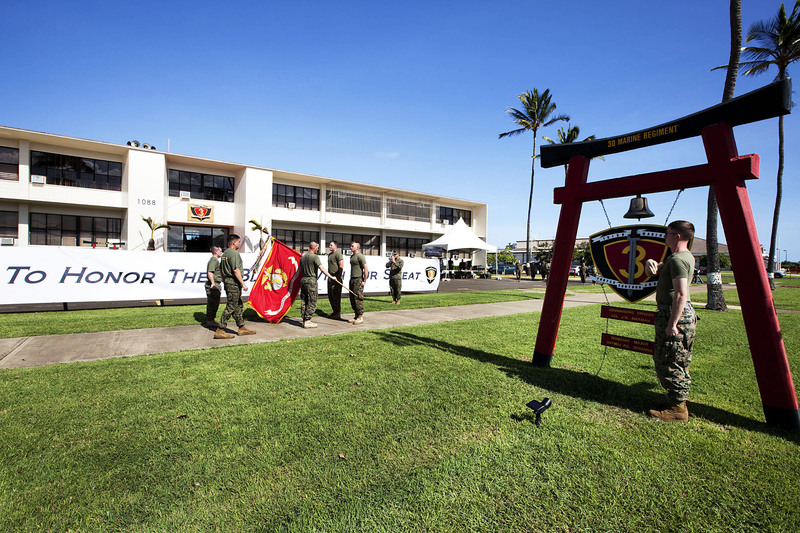 The route took them from the 3rd Marine Regiment headquarters building to the Pacific War Memorial and back.